I grew up in church. I sat through hundreds of Sunday school lessons. I don’t recall one that taught me how to abide in Christ. They may have taught it; I may not have been paying attention. The main points were: understand what Jesus did for you, repent, receive the gift of salvation through faith and repentance, be baptized, read your bible, go to church, give, use the gifts of the Spirit for others, love God, love people, share the Gospel. Doing things for God is supposed to be the fruit of abiding. If we do not learn to receive from God and abide first, doing things for God results in works of the flesh birthed out of striving. Abiding is remaining in God. He is the Vine, we are the branches. I’ve never seen a branch produce anything but death when it’s disconnected and cut off from the vine or tree. It’s life source is the vine or tree. It has no life of its own. I have vine plants and one that looks like a mini tree. There are times where branches will break off, vines will break off; they wither and die. I agree we need to fellowship with other believers. Iron sharpens iron. Two are better than one for many reasons; if one falls in a ditch, the other can pull them out. I have also encountered some people who do “the stuff” but are not connected to the Source or seek to be fulfilled by the Church instead of by God. God is the Source, not people. He will not allow people to fill the void for Him. He alone fulfills the human heart. He completes mankind, not people. We need community; we need God first and most. Anything we place in God’s place will bring disappointment or eventual destruction. The Church is not God, people are not God. God is God. Only He can meet our deepest needs. Jesus gave us great wisdom on how to live a fruitful life in John 15:1-11 (Amplified version). “I am the true Vine, and My Father is the vinedresser. Every branch in Me that does not bear fruit, He takes away; and every branch that continues to bear fruit, He [repeatedly] prunes, so that it will bear more fruit [even richer and finer fruit]. You are already clean because of the word which I have given you [the teachings which I have discussed with you]. Remain in Me, and I [will remain] in you. Just as no branch can bear fruit by itself without remaining in the vine, neither can you [bear fruit, producing evidence of your faith] unless you remain in Me. I am the Vine; you are the branches. The one who remains in Me and I in him bears much fruit, for [otherwise] apart from Me [that is, cut off from vital union with Me] you can do nothing. If anyone does not remain in Me, he is thrown out like a (broken off) branch, and withers and dies; and they gather such branches and throw them into the fire, and they are burned. If you remain in Me and My words remain in you [that is, if we are vitally united and My message lives in your heart], ask whatever you wish and it will be done for you. My Father is glorified and honored by this, when you bear much fruit, and prove yourselves to be My [true] disciples. I have loved you just as the Father has loved Me; remain in My love[and do not doubt My love for you]. If you keep My commandments and obey My teaching, you will remain in My love, just as I have kept My Father’s commandments and remain in His love. I have told you these things so that My joy and delight may be in you, and that your joy may be made full and complete and overflowing. So how do we abide instead of strive? How do we know when we are striving? I will start with question number 2. The engine (God) turns over and off you go. I liken the Holy Spirit to the car’s internal navigation system. Listen to Him; He will get you to where you need to be. Striving produces bad stress, guilt, shame, condemnation, and burnout. Abiding produces rest. Abiding flows from a place of rest. Rest is not ceasing all activity, it’s actively relying on God. My plants don’t strive to produce leaves or branches. They stay connected to their life source. Our life source is God. 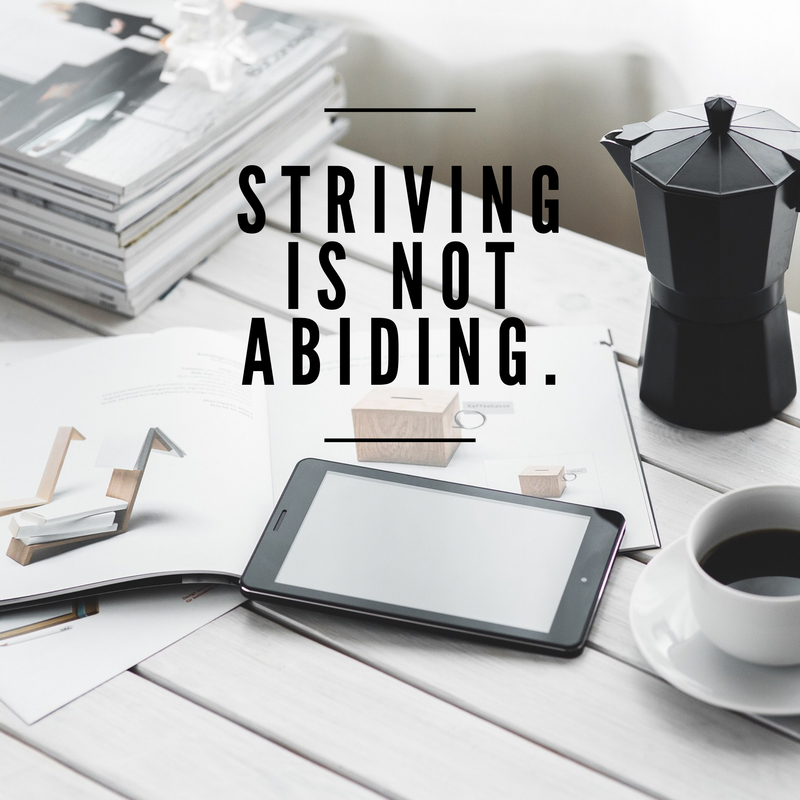 How do we abide instead of strive? Jesus gave us keys to abiding. Be with God. Jesus regularly retreated from the crowds and the disciples to be alone with the Father. He pursued a heart to heart connection with the Father. He stayed full. His source was intimacy with the Father. How do we cultivate intimacy with someone? There’s first an introduction. The Father draws us to Him and offers an invitation to relationship through His Son, Jesus. One of my favorite things is mornings with God. He’s my first hour or couple hours of the day. We chat. I start the day with Him. I am not saying this is for everyone. Each relationship with God is unique. I’m a morning person. You may not be. You may connect in different ways. I encourage journaling or writing down and dating what you sense of from God. Why? We learn over time. I can go back 10-15 years and look at what I felt God was saying and say, “Oh yes, this happened. Yes we prayed this together. Yes! He did this. Yes that was God’s voice.” It builds documented history with God. Some things He spoke 10 years ago are just now coming to pass. How do I know it’s God and not me or the evil one or my imagination? God doesn’t violate scripture nor sin. He won’t tell you to rob a bank or cheat on your spouse. God is good, holy, pure. If it’s perverted, hateful, immoral, leads to shame-it’s not God. God is love. This is not our world’s version of love that says everything is permissible. See 1 Corinthians 13 for God’s view of love. God edifies, redeems, protects, corrects to restore, encourages, empowers. God is not controlling, manipulative, or a bully. If the voice is condemning, pushy, or controlling, it’s not God. Love allows you to choose. It’s great to be invited, right?! Have you ever had a close friend throw a party and they didn’t invite you? Then their response was, “You should’ve known you were invited!” Or have you ever been invited and then the person pretended you weren’t there, that you were invisible? I have. It doesn’t feel awesome to be ignored, especially when people act as if they don’t know you then show up later asking for something. God has feelings sweet friends. We can quench or grieve Him (Ephesians 4:30). I am not saying you have to get into rituals of doing things to include God in everything or feel condemned. I’m stating we grow to know someone by investing time, being with them, and including them in our lives. The more we are with God, the easier it is to abide in Him and what He’s already done. Father God thank You for the finished work of the cross. Thank You for all Jesus paid for. Thank You for the invitation into the greatest love story ever written. You are wonderful. How excellent You are. Teach us Your ways. Show us how to abide, rest in You. Help us to receive ALL that Jesus paid for on the cross and through His resurrection. Flood our hearts today with Your love, Your wisdom, Your goodness, Your power. We can do nothing apart from You. Help each one of Your children to cease striving for what’s given in Your Son. In Jesus powerful name, amen! Sweet friends, you are loved and prayed for often.